What you put on your website is essential for several reasons, including getting other sites to link to yours. "Good content attracts links because it answers questions," says Clay. "You give value that encourages others to link to you. This leads to increased website popularity, search rankings and positive brand exposure." Meanwhile, there are several ways to keep your site fresh and relevant. Blogging. Blogs are easy to update and help you stay in front of your prospects, clients and customers. Blogs can raise your page rank in search engines, sometimes dramatically, in a short time. When your blog becomes popular, it can easily spread by virtual word of mouth. Costco member Joan McCoy, president of Little One Books in Seattle (www.littleone books.com), launched her blog in mid- 2010. Instead of waiting for people to find her, she identified and befriended other bloggers in her industry. "We reached out to bloggers and inserted ourselves in conversations," says McCoy. She saw the power of blogger relations when, one day, her site's visitor traffic went through the roof. "We traced it back to a single blogger who'd mentioned our company," she says. 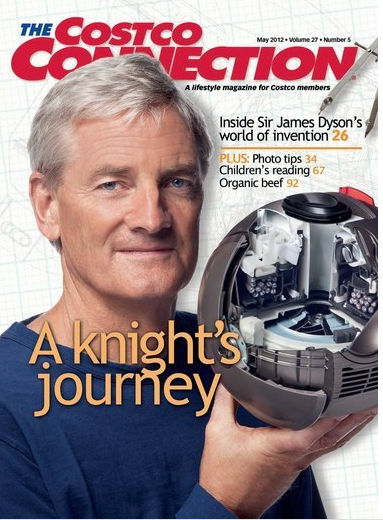 "Now bloggers contact us, often saying it's because 'you're all over the Web!' "
Save time for fun and for romance, separate from work. Joan McCoy, who started Seattle-based littleonebooks.com for ages birth to 5 with her husband, Barney Cohen, says she wasn't prepared for the intensity of working alongside her spouse. Both had previous careers in management. "I wanted to be in charge and he wanted to be in charge," she says. "We'd get stuck and we couldn't make a decision." McCoy recommends any couple going into business together set up separate work spaces (she and Cohen each have an office in different parts of their home) and schedule regular meetings to discuss business. Another important tip: Divide tasks based on strengths and skills. Once they found a system, McCoy says being co-preneurs got easier. On the upside, she says, "our level of commitment is really there. Our only agenda is to be successful." So how do you decide whether jumping into business with the love of your life is smart, or marital suicide? Retailers are catching Pinterest fever as well. Little One Books, a Seattle-based online store that sells books, music, videos and art prints for children, uses Pinterest to group and visually display items for potential buyers. "At first we just thought we would just put our products on it," said Joan McCoy, president of Little One Books, "but every day we seem to find a new angle and creative ways to display information for our age group [birth to 5 years old]," including craft ideas and mommy blogs. Pinterest hasn't decided the best way to make money. Right now the company says it is concentrating on adding users to its free site and is exploring different revenue opportunities, such as selling advertising space or charging retailers when users click on links to purchase items. My baby is growing rapidly. I know this because my belly is growing rapidly. My excitement to meet my little cherub is growing exponentially, and books are a huge part of the stimulus. I am lucky enough to work with children's books, and while I am reviewing them for work, I find myself daydreaming about reading them aloud to my little one in just a few months. My favorite children's author at the moment is Mo Willems particularly Don't Let the Pigeon Drive the Bus and Pigeon Wants a Puppy as they are the first children's books to have me full on belly laughing every time I read them. I can't wait to do my funny pigeon voice for my little one and make him or her laugh along with me. I've tried it out on my husband a few times, and although he does laugh, it may be more at my antics than the pigeon's. I recently registered for books and CDs through the Little One Books baby shower registry and had so much fun choosing a mixture of favorites from when I was little (like Dr. Seuss' Go! Dog! Go!) and new classics, such as If You Give a Pig a Pancake. Technology has its advantages in motivating us to learn more, think differently, and reach new heights in understanding and experiencing all the world has to offer. However, should we forgo the gift to our senses that a newspaper, magazine, favorite book provides to our fingers, our nose, or our feelings? Stepping Stones Together sat down with president of Little One Books and we share a similar sentiment about the power of literacy and reading books. We are happy to share her recent thoughts on the power of picture books. Dogs are great at begging, but it's not so easy for humans. There's a lot of competition for charitable dollars. With so many worthy causes and nonprofits needing assistance, it's important to approach companies the right way when you're asking for support. We found out what works and what doesn't straight from those who have gone through fundraising experiences. Don't worry, no puppy dog eyes required. You may be working on your cause, but when you turn the focus on the company you'll have a better shot at getting them to hand over money. Joan McCoy, President of Little One Books says it's very helpful to make a meaningful connection with someone in the company and research their goals. "Most companies think of donations to nonprofit organizations as investments, and therefore, they want to know how their investment is going to benefit them," says McCoy. "You have to be able to explain how the donation will help the company with whatever goals they are trying to achieve with their contributions program." On a recent Tuesday afternoon, twelve kids under the age of six are dancing and waving scarves to the classic Muppet tune Mahna Mahna. When Nicole Koleshis, the only adult in the room, says "freeze" they all stop in their tracks. Then, upon her direction, take their place in a circle at the center of the room. Many adults would hesitate before accepting charge of a dozen young kids for almost an hour in a confined space. But Koleshis, a children's yoga teacher and occupational therapist in Seattle, has found her calling. Koleshis has taught yoga to children for the past seven years, including those she encounters in her work as an occupational therapist for the Seattle School District. She considers it an essential part of her therapeutic intervention when working with children on the Autism Spectrum and those with developmental delays. "Yoga not only has the potential to improve one's motor skills, but it also provides strategies for increased focus and concentration, as well as relaxation techniques, that can be carried over throughout the school day," Koleshis explains. Koleshis teaches three kids classes a week at Lotus Yoga, a thriving yoga studio located on the quaint main street of Columbia City, a neighborhood in the south of Seattle. Her students arrive about ten minutes prior to class to sign in, and then spend the remaining time taking off their shoes and socks and munching a quick snack. When Koleshis announces with a smile that class is about to begin, there's a scramble to gather before the glass door that leads to the studio. As a small business owner, your livelihood largely depends on your ability to meet your goals. But actually setting the right goals can be a tricky task. Here are three common goal-setting mistakes identified by small business owners, and how you can remedy them. Joan McCoy, president of Little One Books, an online children's books and media store, says setting unrealistic goals is one of the biggest mistakes she made when she launched her Seattle company last April. She wanted to sell $1 million worth of products within a year. But two months in, she realized that goal was unreachable. "Our goals were way too ambitious for a short period of time," McCoy says. Though McCoy says her company still has managed to do about $100,000 in business, she says she's learned to research the achievability of goals before she sets them. She's educated herself on how long it takes to complete an online sale, for example, and her new goals reflect that, she says. A month after co-founding Little One Books, Joan McCoy, along with her partner and colleagues, sat around admiring their newly-built Web site with no idea what to do next. For eight months, the retailer, which sells vetted music, books and videos aimed at newborns and children up to 5-years old, had no online presence beyond its Web site, LittleOneBooks.com. "We spent a lot time asking our friends and family to visit the site. People would ask, 'Do you have a blog? Do you Twitter?' I had no idea what Twitter was," recalled McCoy, who is in her late-50s, "We had never heard of 'social media' as a term." While the term "social media" was a foreign concept to McCoy and her team, her company was in desperate need of it. "As a mom, I love to get my son good quality books! Luckily I went to school to become an Elementary Teacher and took a few Children's Literature classes. I learned the in's and out's of children's literature books. But for those who do not know how to find great kids books... Little One Books is your answer." "Little One Books is a treasure trove for moms of fantastic books, music and videos that are age appropriate and provide great substance." 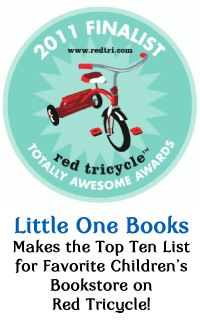 "Little One Books is easy to navigate, well thought out, and simple to maneuver around in. The products are well researched and the descriptions are helpful and accurate. The products are categorized by age, making it simple to focus on the products for a particular child I am thrilled to say that this site has become my newest tool in expanding, not only my knowledge of what I can offer them, but my children's learning spectrum." "Their site is easy to navigate, allowing even those who may be a bit timid around computers to find products with ease. This is especially nice for grandparents who simply want to find some products for when their grandchildren come to visit." "For parents, grandparents, aunts, uncles, and care takers, Little One Books provides you with a safe place to shop. A safe place whose products have been through the grandparent test and whose 'test results' are transparent in their product descriptions. To be honest, I find this business approach rather refreshing." 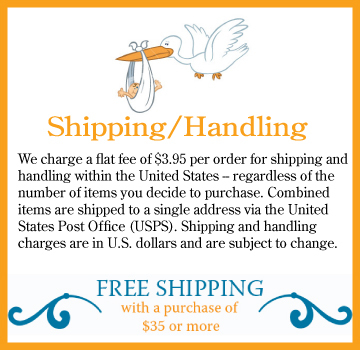 "What sets Little One Books apart from many other online retailers is that each product is personally reviewed and hand selected to benefit children of all ages. 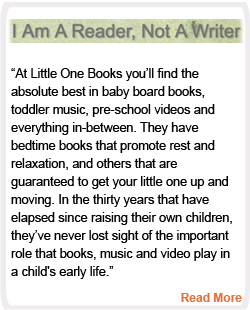 After perusing the website for some time, it's clear to see that selection of items offered by Little One Books are truly quality products that I personally would recommend to parents!" "I'm thrilled to see that someone took the large amount of time required to review every item in detail and provide that information to inform and educate parents on the specific products chosen. Coming from a set of grandparents, I trust that each item is quality and I love that I don't have to spend the time doing research when choosing books, dvd's and music for my girls, because it's already been done for me!" "You'll likely see classics you read as a kid, stories you recognize, but you'll also find books, music and movies that you may have missed when visiting a large retailer with the large number of items available for kids!" 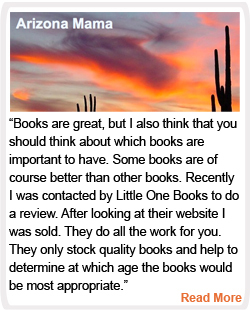 "I recommend Little One Books for all parents looking for good books for their children. They have a great selection, they explain all the books really well, and there is definitely a book that every parent and child will like!"